The LHRy Board is pleased to announce that Richard King of Union, NJ has been unanimously elected to be a Director, replacing Ted Brewer who is retiring. 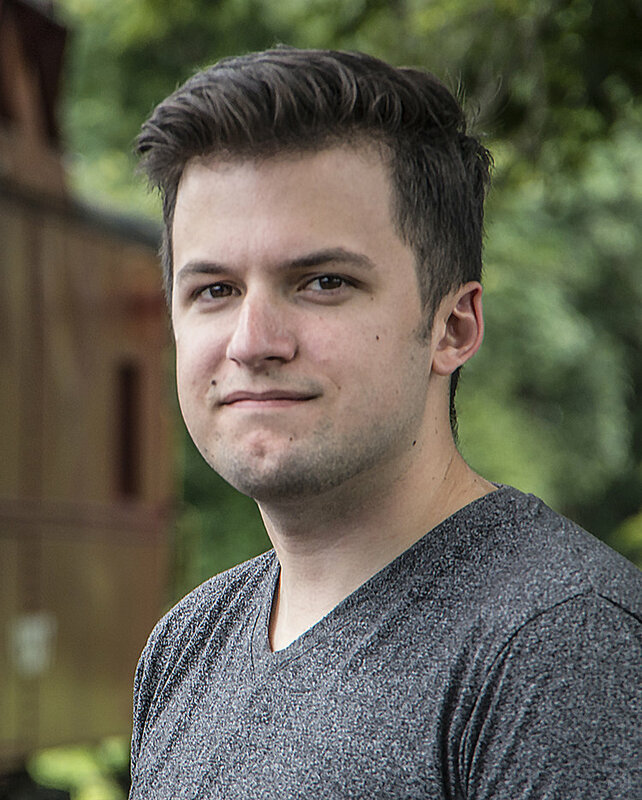 He is an outstanding Rahway Valley Railroad historian and author, employed in Sales Operations at Jaguar Land Rover North America, Mahwah, NJ. “Richie” is currently Treasurer of Tri-State Railway Historical Society, Morristown, NJ. He has a Bachelor of Science in Accounting from Ramapo College of NJ, Anisfield School of Business. We thank Ted Brewer, a founding Director of LHRy, for his eight years of service and dedication to our cause - he is now a Director Emeritus. Vulcan Iron Works of Wilkes Barre, PA, (1860s to 1950s) was a builder of hundreds of small industrial type locomotives. In 1942 they produced an 0-6-0 Tank steam locomotive for the US Army Corps of Engineers, one of 382 in the class that saw service variously in the UK, western Europe, the Middle East, and North Africa. It was shipped across the Atlantic in 1943 and operated in the UK as War Department No. 1960 until the end of hostilities. It was purchased by the Southern Railway (UK), and worked at Southampton Docks, and later at the Ashford wagon works until 1968. 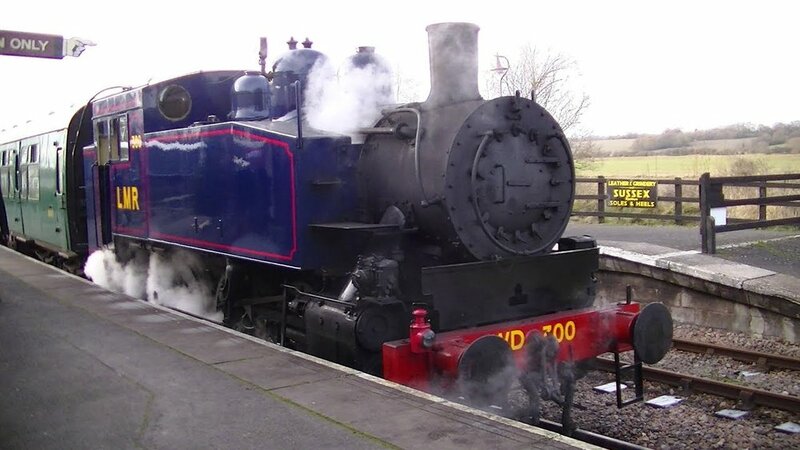 The embryonic Kent & East Sussex Railway preserved it for future heritage operations. Finally in 1994, with restoration completed it entered service for the next 10 years, until it’s boiler certificate expired. A second round of restoration was begun in 2012 and it was decided to return it to service in the striking blue livery of scrapped classmate No. 300, which was the last representative of the class operating on the Longmoor Military Railway in Hampshire. The original No. 300 was named after Major General Frank. S. Ross, a distinguished member of the US Army who was chief of transportation in the European theater of operations in the Second World War, and his name will be placed on #300. The restoration was completed late in 2017, just in time to delight Santa Special passengers. K&ES Ry has a second USA 0-6-0T, BR No. 30065, which is in queue to be restored by 2022. After several attempts to stop roof leaks on our Whitcomb switcher we finally engaged Diamond Crossing Enterprises, LLC on 11 December. John Nolan and his helpers, Ryan Murphy and Rocco Miele, came up from Langhorne, PA and applied a commercial rubber roof membrane. It leaks no more! LHRy Chair, Capt. Bill, in his new Honda CR-V "company" car. A selection of canal books focusing on New Jersey (both Delaware & Raritan and Morris Canals) have been donated to the research libraries of the following maritime museums: New Jersey Maritime Museum, Beach Haven; The New Jersey Museum of Boating, Point Pleasant; Toms River Seaport Museum, Tom’s River; Tuckerton Seaport & Baymen’s Museum, Tuckerton; and the Canal Society of New Jersey, Waterloo Village; by Capt. Bill McKelvey, Chairman, Liberty Historic Railway. All of the above are considered excellent, with the NJ Maritime Museum rated outstanding by McKelvey. The Liberty Historic Railway board is happy to report that we have received our first major funding from the public. A NJ Family Foundation sent us a $5,000 grant in September to be used for railroad projects. We interpret this as an endorsement of the type of projects we have been funding recently. It was our hope that such confidence would be fostered by our new “Project Funding” rack card which we are distributing as well as the project funding record posted on our website. During August, LHRy received an additional $90,000 of supplemental funding from a board member. LHRy supports the D&R Canal Watch, whose mission is to protect, maintain, and promote the recreational, historical, aesthetic, and environmental qualities of the Delaware & Raritan Canal State Park and its environs, to assist and to support regional, state, local, and private enterprise efforts that contribute to this goal, and to investigate the restoration of the canal to through navigation. The D&R Canal Watch now has a Facebook page, and we encourage our members and friends to join! D&R Canal Watch is looking for volunteers for few hours to staff its table at one or more of these festivals. For all of these events, D&R Canal Watch will supply a table, chairs, tent, and banner. Total auto gridlock at Liberty State Park was observed on the weekend of July 29 - 30. The west end of Zapp Drive was subject to bumper to bumper stagnation due to full parking lots. As a result, Park Police blocked off Morris Pesin Drive, Freedom Way and Zapp Drive east of the ferry parking lot. A plan that would have prevented this mess and others like it was put forward by Liberty Historic Railway with an award-winning LSP Transit Study by Sam Schwartz Engineering a couple of years ago. It called for the re-creation of a historic electric trolley operation on its own private right-of-way along the south side of Zapp Drive. Vintage streetcars would shuttle park goers between the Central Railroad of New Jersey Terminal on the Hudson River and the Hudson Bergen Light Rail’s Liberty State Park station adjacent to the Liberty Science Center where parking spaces are plentiful. Sadly, this solution to traffic congestion received unreasonable opposition from the Friends of LSP. They claimed buses were the answer – but we know they would be trapped by the same auto gridlock. They stated that the trolley would take “blanket space” from park visitors - not credible - no one would want to spread a blanket out 10 feet from a busy roadway in a 1,200 acre park! Two years ago a meeting at the Thomas Edison Laboratories National Historic Site on Main Street in West Orange was attended by LHRy Chairman McKelvey. At the time the remnants of the pioneering Edison Menlo Park electric railway displayed at the front of the building were noted to be in a rather deteriorated state. We offered financing to restore and place them on short sections of vintage rail. Park staff said they had the funding and they planned to do the work. They have done so! 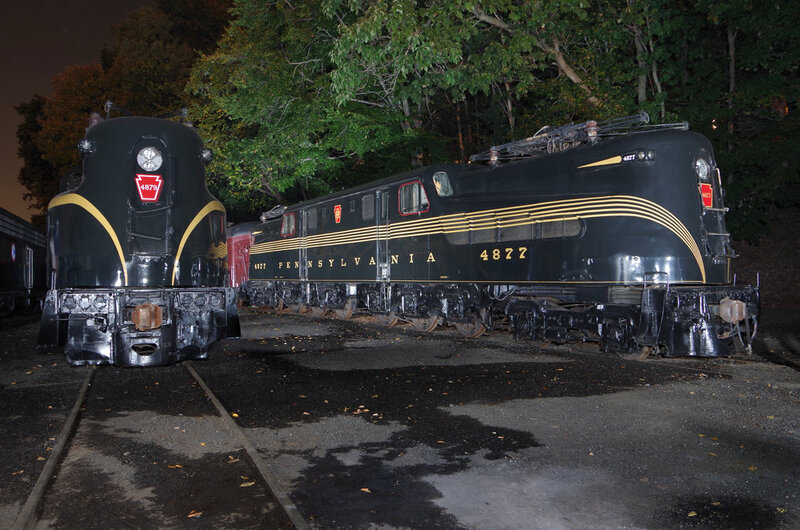 An excellent restoration has been completed to preserve these iconic NJ artifacts on rail. Photos by Gage Bongiovi, Thomas Edison National Historic Park. The demolition of the historic Lackawanna Railroad ferryboat Binghamton (built in 1905) has commenced. The ferry, listed on the National Register of Historic Places in 1982, was severely damaged beyond repair by Hurricane Sandy. Click here for the full story. Sounds and sights of the GG1 locomotive in operation, from an January 2, 1982 video taken in the cab by Mitchell Dakelman from South Amboy, NJ to New York Penn Station. DVD copy provided to URHS by LHRy Chairman Bill McKelvey. URHS owns and has cosmetically restored GG1s #4877 and #4879 into iconic PRR paint schemes. June: A Thank You From the Steamboat Crew! Many thanks for your extremely generous support of the Steamboat Floating Classroom. With our boiler re-tubing complete, and your help, SPLASH is providing many trips this Summer season to groups from Hunterdon, Mercer, Bucks, and other counties. New-build 4-6-2 Tornado reached 101 miles per hour on a test run, setting a new heritage steam era record in the UK. A unique spectacle saw four trains - one headed by vintage steamer Flying Scotsman - run in staggered formation in parallel on 10 miles of main line to promote Virgin Trains’ new Azuma units due to enter service in 2018. The Flying Scotsman toured NJ and the US in 1969. A phenomenal response to the Gloucestershire Warwickshire Railway’s £1.25 million Broadway extension stock offering means that trains will be running into the tourist honeypot next year. Three vintage steam traction engines hauled the Isle of Man Steam Railway’s 2-4-0T Fenella up the 1,800 foot road climb of Snaefell Mountain. The second Great North Steam Fair took place at Beamish Museum in April with a line-up of over 100 vehicles in action and on display, including a 15" gauge 2-8-2 carried on a trailer drawn by a steam traction engine. New-build locomotives Samson and Steam Elephant operated on the Pockerly wagonway and 1871-built Coffee Pot, hauling chaldron wagons was joined by Puffing Billy, making a rare working visit to the colliery railway. Beamish regularly operates vintage trams, steam locomotives, electric trolley buses, motor buses, and horse-drawn vehicles. On Saturday, June 10th, members of the Military Transport Association of North Jersey set out for a special guided tour of the Military Technology Museum of New Jersey, housed within the InfoAge Science History Learning Center, 2201 Marconi Road, Camp Evans (formerly Fort Monmouth’s Top Secret radio testing facility), Wall, NJ. Gary Shultz was the driver of the comfortable Ford Transit 350 12-passenger van that the group rented. This museum has amassed one of the largest and rarest collections of both static and operating military vehicles and equipment in the world. Their extensive collections include some of the rarest military and non-military vehicles such as prototypes and concept vehicles, including the war-born Jeep’s history from start to finish. Many of their some 80 vehicles are in their original condition, and others have undergone various stages of restoration. There are not only Jeeps, but Seaps, a DUKW, Weasels, tanks, a 1940 VC Carryall, an Aqua Cheetah prototype (one of the world’s first amphibious vehicles), a Clark military bulldozer, and a WWII German military vehicle collection, including a motorcycle-like half-track. Bolstering the outstanding exhibits are hundreds of vintage military artifacts, equipment, models, uniforms, illustrations, etc. At the rear of their museum facility, the Military Technology Museum has a restoration shop area and thousands of spare parts. They plan to upgrade and add additional exhibits and displays in the future, including more of their popular, interactive, video programs. This reporter (Capt. 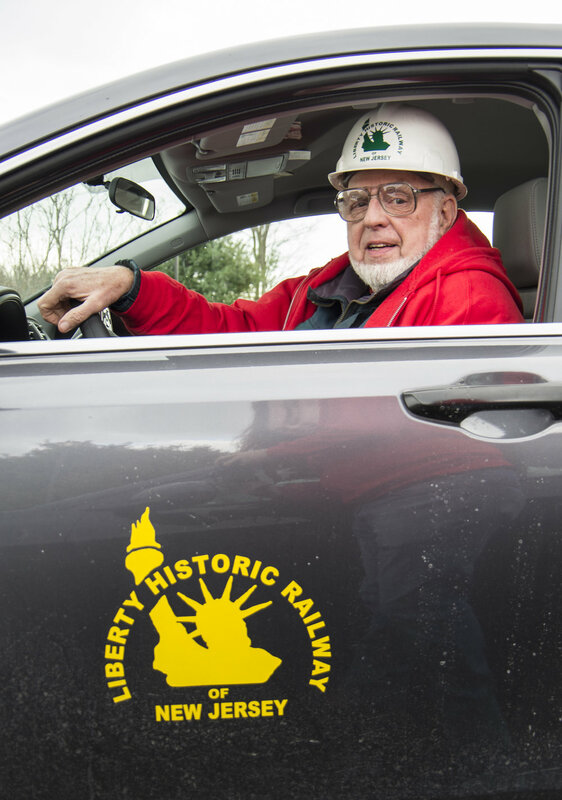 Bill McKelvey, Chairman, Liberty Historic Railway) was especially intrigued by the MTM’s plan to install a panel of railroad track for display of a Jeep equipped with railroad wheels. Now, that’s a project LHRy could be interested in funding! In fact, we can source the 36 feet of light-weight rail which would be appropriate for their exhibit. On June 3rd and 4th, M&E C-424 #19 made its last runs on the Morristown & Erie. 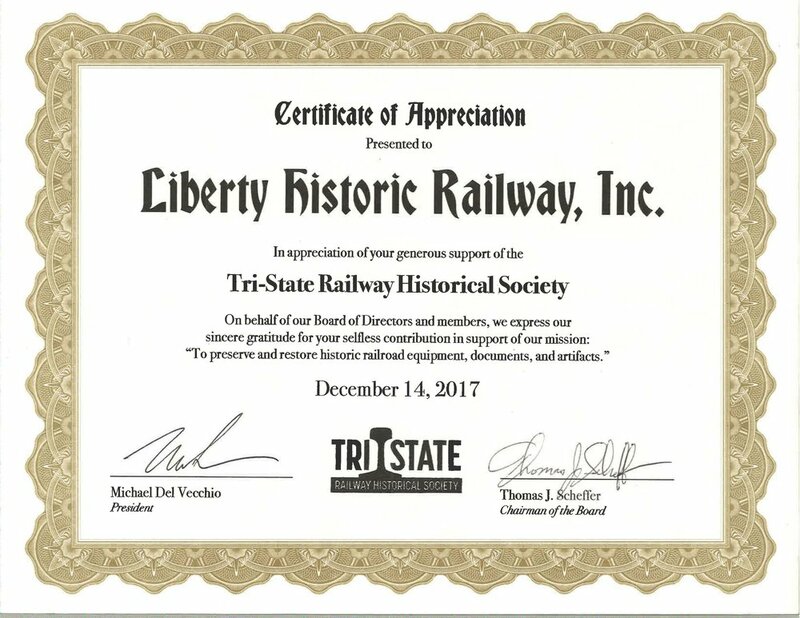 Acquired by the Tri-State Railway Historical Society through funding secured from Liberty Historic Railway, this locomotive will be relocated to the URHS's Boonton Yard in the near future. Bill McKelvey, Steve Gerritsen, Larry Gross, and Alan Bird have just finished reinstalling step boxes, buffer plates, and brake rigging on the Westphal after arrival at Kenvil on May 24, 2017. Photos by Dan Morgan. GE 45-T loco "William" tows stripped-down Whitcomb 30-T loco "Thomas" to Boonton Shop for priming and painting by rail restoration contractor Star Trak, Inc. Video by Alan Bird. This 1927 locomotive, donated to LHRy by Public Service Electric & Gas is shown in the photo below hard at work moving a transformer at the Athenia (Clifton) Substation. 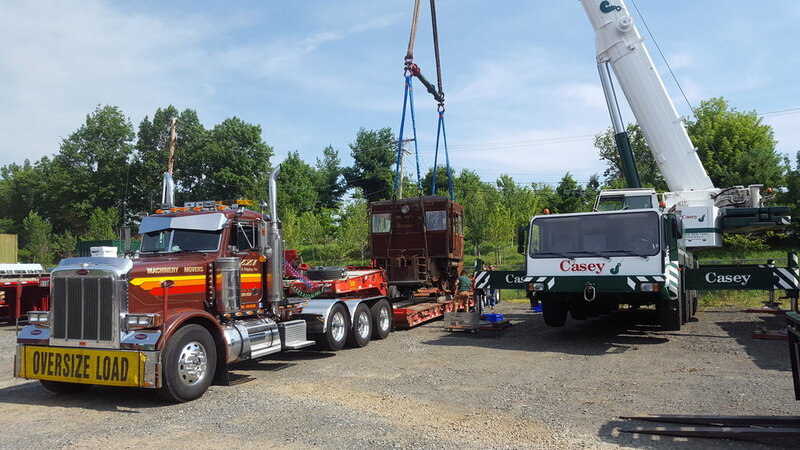 It was trucked from Branchburg, NJ to Boonton in 2016 and restoration work began: remains of the deteriorated windows, wood floor and roof, were removed as were three steel cab side panels. The Caterpillar diesel engine was found to rotate freely and fuel tank was removed and repainted. A deteriorated key steel structural member under the rear of cab was replaced. Replacement windows were acquired and new treated wood structural members were acquired and roof “bows” were cut. Primary volunteers have been Alan Bird, David Lemmo and McKelvey. We are happy to report that LHRy delegate to URHS and retired PSE&G employee, Dave Lindstrom has joined our effort. Work, suspended for winter, has resumed: New logos and names have been acquired. New grease fittings have been installed on side-rods and all grease points have been recharged. Many dozens of old rivets have been removed in preparation for replacing the new steel side sheets (on hand); deteriorated steel air piping has been replaced, shop air charged storage tanks on locomotive tested and got working the air brake system, clogged drain valves on both air reservoirs, both sanders and whistle. A vintage photo of our Whitcomb shows it fitted with a typical skinny, 12″ tall trolley whistle – like the one currently on the GE 45 ton loco “CAPT. BILL” / “WILLIAM” at Boonton. We tried and rejected an original peanut whistle from a steam crane at the PS Marion generating station as being far too shrill. We will use a small four-note air whistle from a Hudson & Manhattan RR black car, donated to Capt. Bill by the late Phil Craig. It is our intention to install McKelvey’s 2/3 size locomotive bell which was mounted on the counter in the Phillipsburg Union Station. However, it was removed by Friends volunteers when the counter was discarded and they can not now find it. The Canal Society of NJ was alerted to the discovery of the remains of a bow section of a Morris Canal boat. It was found to have been used as the foundation of a residential structure in Highlands, NJ when the building was being elevated above flood zone following Super Storm Sand damage. The boat remains were donated by the owner to the Canal Society of NJ. The coordination of the move of the boat remains and trucking to Waterloo Village were arranged by McKelvey. Capt. Phil Francis (owner-operator of Shadyside Trucking) brought his tractor trailer rig and big fork lift to Highlands to load the bow and floor sections of the boat. Phil, climbing into his cab on the left, has made many dozens of discounted cost moves over the years for Friends of the NJ Transportation Heritage Center, United RR Historical Society, Liberty Historic Railway, Phillipsburg RR Historians, Whippany Railway Museum, StarTrak, and other organizations. Francis retired as Capt. from the Ridgewood Fire Dept., NJ National Guard, and finally, from the trucking business on April 1st, 2017. A big thank-you to Capt. Phil for all his trucking helpover the years! The Morris Canal boat remains are now an excellent hands-on interpretive exhibit in the barn behind the CS of NJ museum at Waterloo Village. LHRy coordinated and funded the move of remains of a Morris Canal boat from Highlands, NJ to Waterloo Village for preservation and display. The 100+ year boat remnants were found to be the foundation of a residential structure which was raised above the flood plane. The artifacts were donated to the Canal Society of NJ by the Scanlon Family and moved on 7 October by the tractor-trailer & fork lift of Shadyside Trucking - Capt. Phil Francis owner/driver. LHRy has renewed their sponsorship of the annual Toys for Tots collection trains organized by the Military Transport Association of North Jersey. At the LHRy board meeting of 26 September, funding for the repair and restoration of the 1946 Ford Transit bus owned by Friends of the NJ Transportation Heritage Center was approved. It will be repainted into the original Somerset Bus Co. colors and moved to the Lakewood garage to join the balance of the restored bus fleet. LHRy is in discussions with the Delaware & Raritan Canal Watch on funding for construction of a replica canalboat to provide educational ride experiences on the D & R Canal for the disabled and the general public.